Can you believe that a friend of mine received her hardcover version of my book in the mail last week? No! Me neither! Obviously spending 18 months of my life writing, editing, finding a publisher, editing, negotiating with publishers, editing, editing and more editing, does not make me worthy enough to be the first to receive a copy. My friend’s husband said – during my FaceBook tantrum – that it’s not like I don’t know what happens at the end – not the point! As you can see by the pic, it looks quite good, but then I would say that because I honestly never thought it was possible to turn it into a real book. So, not only am I a little ticked off about this, I then discover that those naughty people at Amazon are screwing around with my prices and charging insane amounts of money here in Canada, and particularly in the UK. The novel is set in the UK; it is going to hopefully be a big market for me, not to mention it being my motherland. Who do they think they are? Don’t they have enough money? I would like to publish the sequel, people, at least let me make something out of this one! On a more positive note, I was quite excited to read the one and only review that someone kindly posted on Amazon.ca. She gave it 5 stars…. 5 STARS!! Apparently she ‘couldn’t put it down’ and ‘didn’t want it to end. It was funny and sweet, and definitely a little steamy’. She fell in love with my characters, Frankie and Jack, and she can’t wait to find out what happens next! A big fat YAY to me! Only one review but hey, an author has to start somewhere. So what are you all waiting for… get your copy now and tell me what you think. Go on… I know you’re dying to read it! This entry was posted in Ankylosing Spondylitis, Contemporary Romance, Erotica, New Author, Self Publishing, Writing and tagged Achievement, Ambition, Ankylosing spondylitis, arthritis, Book pricing, Book review, chronic disease, Contemporary romance, writing on September 29, 2014 by llindley72. It’s been sometime since I read (rather than wrote!) a book I haven’t been able to put down. I’m a ‘read a chapter every night in bed’ kind of reader. I have just finished reading the type of book I wish I could write, and maybe one day I will. Amusing, romantic, and emotional… ‘Me Before You’ by JoJo Moyles. It was the kind of book that helps me put my own pain and suffering into perspective, especially when I’m having a bad few days, which I am right now. Even though I am reduced to tears when my husband is digging his elbows into all those nasty tight knots, really, it’s not that bad. Even when my physio is sticking needles in my backside and the pain is so intense I want to scream the clinic down, really, it’s not that bad. Even when I can’t do something I used to do with regularity and complete ease, before I was diagnosed with ‘it’, really, it’s not that bad. It controls. It plays games with my mind. It chips away at everything, claiming little pieces of my life. It makes me rebel. It makes me angry. It has changed parts of me, both mentally and physically, so much that I’ll never be able to go back to being ‘me before ‘it’’. One of the biggest physical changes has been losing muscle tone through lack of exercise, and significant weight loss due to dietary restrictions and medication induced nausea. I used to be curvy, but fit, toned and healthy looking. Now, I find I’m unable to purchase a particular item of clothing I like because they don’t make it small enough, and I have women telling me how amazing I look, which is a great confidence boost, but they have no idea how and why I got here… ‘it’ led me. I used to love all kinds of food – there was very little I wouldn’t try or eat – but now, food and I are not very good friends. When I hear the compliments, it gives me a greater understanding how those with eating disorders can carry on doing what they do. The compliments drive them on to continue. Thankfully I actually do want to eat, but ‘it’ is in control of that, not me. Once again I give you the reason why I wrote a book. I’m not looking for a new career, or to be recognized as great writer. I’m not looking for fame and fortune. Granted, if it all comes good and those things happen, well hey, bonus! It’s out there now, and it’s even being read somewhere in the world, because people have bought it. It is something that ‘it’ can NEVER take away from me, it can’t even get close. ‘It’ has no claim on any part of my publication, this is all about me… and not ‘it’. You can buy a copy of my debut novel, Bruises directly from my publisher. It is also available on Amazon and other online bookstores around the world. This entry was posted in Ankylosing Spondylitis, Contemporary Romance, Erotica, New Author, Self Publishing, Writing and tagged Achievement, Ankylosing spondylitis, arthritis, Autoimmune disease, Biologics, chronic disease, Chronic pain, Contemporary romance, Erotica, reading on September 23, 2014 by llindley72. It’s real, it’s official, and it’s now available to buy, and people already have!! I knew it was due to be released any day, but I didn’t actually get formally told that it had gone live. The moment when I saw my book for sale on Amazon, I swear I stopped breathing. The sudden realization that I’d actually done something that nobody and nothing can take away from me. It was finally a reality, not just file on my desktop anymore, but an actual product that will hopefully collect dust on several bookshelves, potentially all over the world. I then think I had a moment of ‘oh, what have I done!’ Then I found out that my first hard copy had been sold online, and the overwhelming urge to dance around my friend’s living room and behave like a giggly teenager resuscitated me. I was then whisked off to the liquor store to buy something bubbly, and our evening of crafting went all to hell in a handcart!! My 5 year old made me smile when he discovered that I’d actually sold a copy – he declared that means I now have a proper job like daddy. It’s interesting that young children don’t see that they themselves are a full time job; ahh yes of course, I’m just a mum! As it happens I really don’t see either as a job. Being a mum is a significant part of my life, something that I find incredibly rewarding and totally frustrating all at the same time. The author thing is just a kind of hobby really, another one to add to my list of pastimes. Something to stop me going brain dead and hopefully make me more interesting so I have more to talk about than snotty noses or Lego! 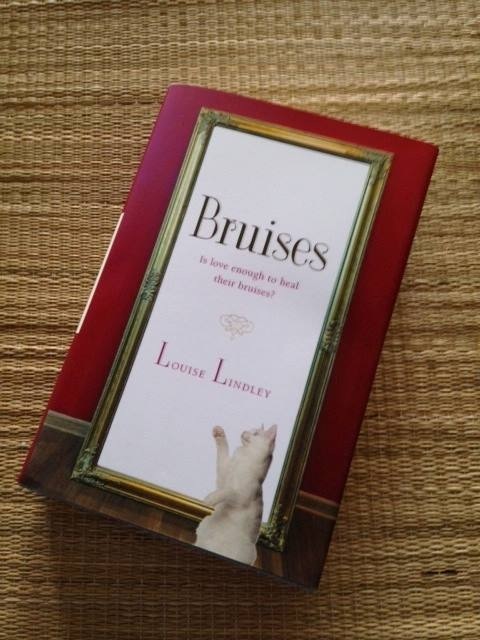 You can buy a copy of Bruises directly from my publisher by clicking here. It is also available on Amazon and will soon be available on other online book stores. A synopsis is also available on the Bruises Facebook page, which you can Like & invite others to Like. I’m grateful to anyone & everyone who’s kind enough to show their support & spread the news. This entry was posted in Ankylosing Spondylitis, Contemporary Romance, Erotica, Self Publishing, Writing and tagged Achievement, arthritis, Author, Autoimmune disease, Book information, Child honesty, chronic disease, Contemporary romance, Erotica, New author on September 18, 2014 by llindley72. It has been a long summer, entertaining the kids in-between proof reads and negotiations, but I got there in the end. Honestly, how is it possible that a three-word sentence could cause so much trouble? Well it did! I don’t know whether it just kept getting missed in the revision rounds, or even if it was identified at all at any point as not being aligned, but it certainly stood out in the final proof, when I noticed it was also still in capitals and not lowercase – the quality control check even missed it! When I pointed it out to her, my account manager was surprised it hadn’t been flagged too; she got on the case, and it was finally sorted. Meaning I could finally sign off the proofs to go to print, finally sign off the book cover designs, and finally see the light at the end of the tunnel. If all goes according to plan my book should be available for purchase in a couple of weeks… YIKES!! It couldn’t have worked out any better. Last week was the start of a whole new chapter for me… both my boys are finally in full time school. This week will be my first real week of child freedom; the things I am going to achieve are nobody’s business. I give it three days before I’m running around like a headless chicken, and legging it into school almost late for the pickup! I have promised my husband I will take some time to ‘relax’ each day. I have no idea what it is, this ‘relax’ he speaks of, so if anyone can enlighten me I would appreciate it. What does ‘kids in school’ mean to me really? Well, reduced stress in the grocery store; no childcare worries when I have any of my various appointments; walking the dog without clock watching; the floor will stay clean for two hours after my lovely cleaner has left, instead of two minutes; actually cooking a meal instead of throwing it at the oven or crockpot and hoping that it turns itself into something edible for dinner; and of course, the most important one that all mums miss… peeing in peace!! Yes, nobody knocking on the door and trying to have a conversation with me through it. I can sit on the throne in the peace and quiet of my own home and spend a penny without any interruptions… well for a few hours anyway. Watch this space for the official release date of my debut novel Bruises. This entry was posted in Ankylosing Spondylitis, Contemporary Romance, Self Publishing, Writing and tagged Achievement, Ankylosing spondylitis, arthritis, Author, motherhood, self publishing, writing on September 10, 2014 by llindley72.